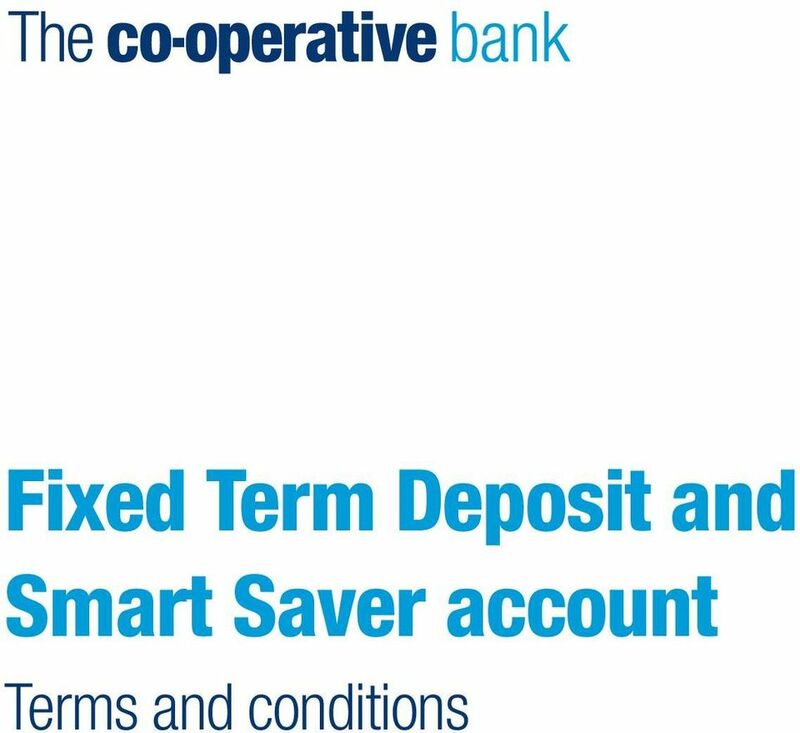 Download "Fixed Term Deposit and Smart Saver account. 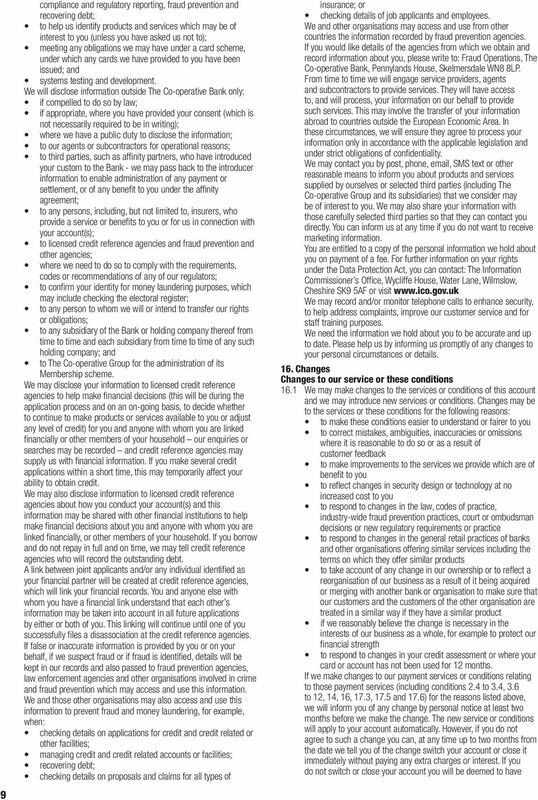 Terms and conditions"
11 10 accepted the change. 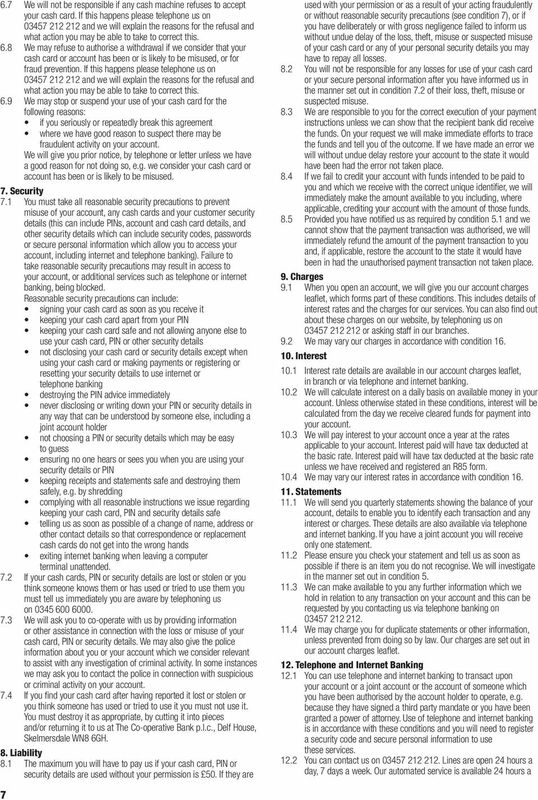 Remember you can close your account at any time if you wish (see condition 14). For all other changes to our services or conditions for the reasons listed above: where the change is more favourable to you we will tell you of any change within 30 days of the change being made in national press advertisements, statement messages or statement inserts. 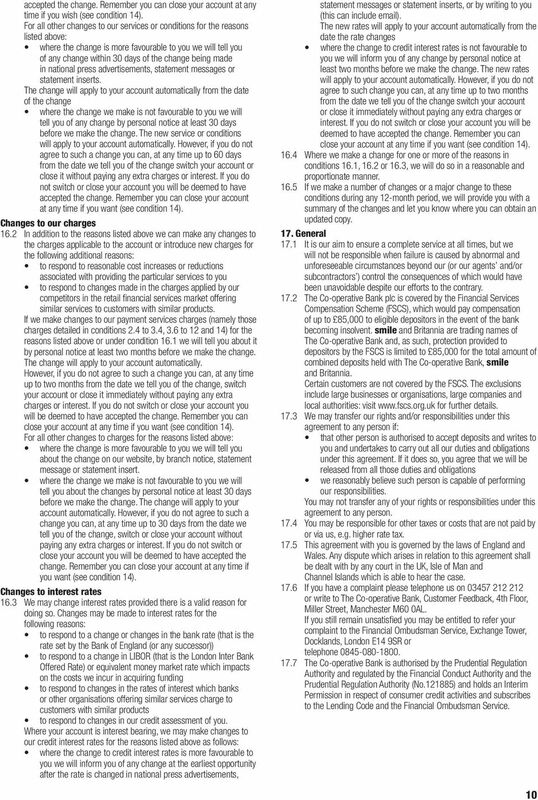 The change will apply to your account automatically from the date of the change where the change we make is not favourable to you we will tell you of any change by personal notice at least 30 days before we make the change. The new service or conditions will apply to your account automatically. However, if you do not agree to such a change you can, at any time up to 60 days from the date we tell you of the change switch your account or close it without paying any extra charges or interest. If you do not switch or close your account you will be deemed to have accepted the change. 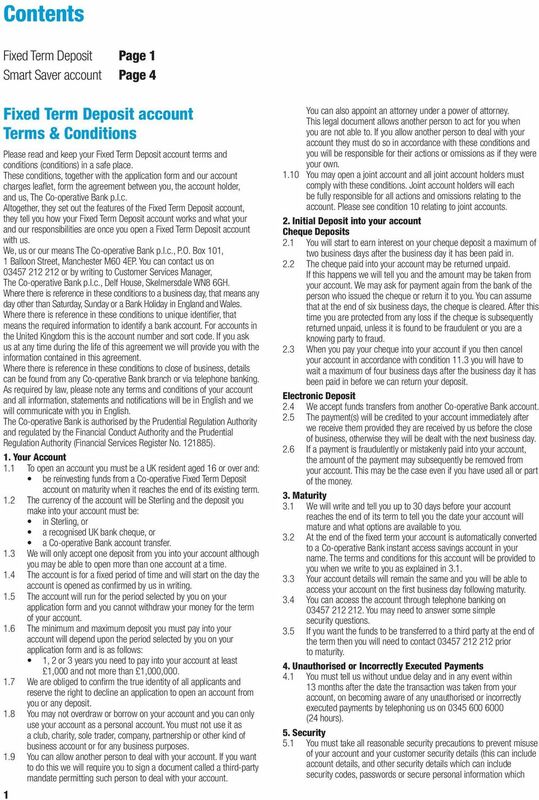 Remember you can close your account at any time if you want (see condition 14). Changes to our charges 16.2 In addition to the reasons listed above we can make any changes to the charges applicable to the account or introduce new charges for the following additional reasons: to respond to reasonable cost increases or reductions associated with providing the particular services to you to respond to changes made in the charges applied by our competitors in the retail financial services market offering similar services to customers with similar products. 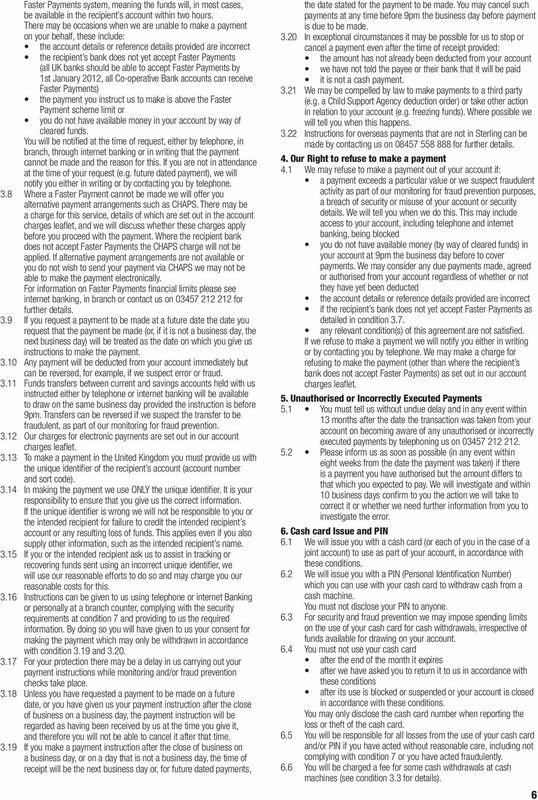 If we make changes to our payment services charges (namely those charges detailed in conditions 2.4 to 3.4, 3.6 to 12 and 14) for the reasons listed above or under condition 16.1 we will tell you about it by personal notice at least two months before we make the change. The change will apply to your account automatically. However, if you do not agree to such a change you can, at any time up to two months from the date we tell you of the change, switch your account or close it immediately without paying any extra charges or interest. If you do not switch or close your account you will be deemed to have accepted the change. 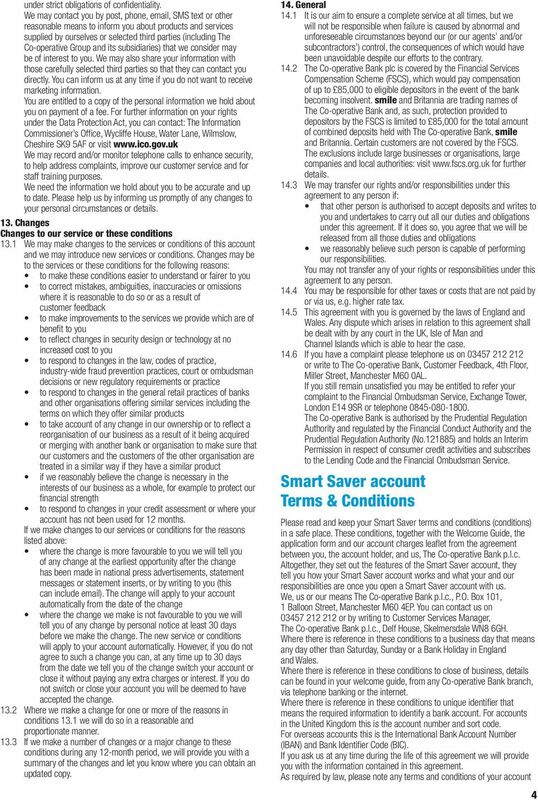 Remember you can close your account at any time if you want (see condition 14). 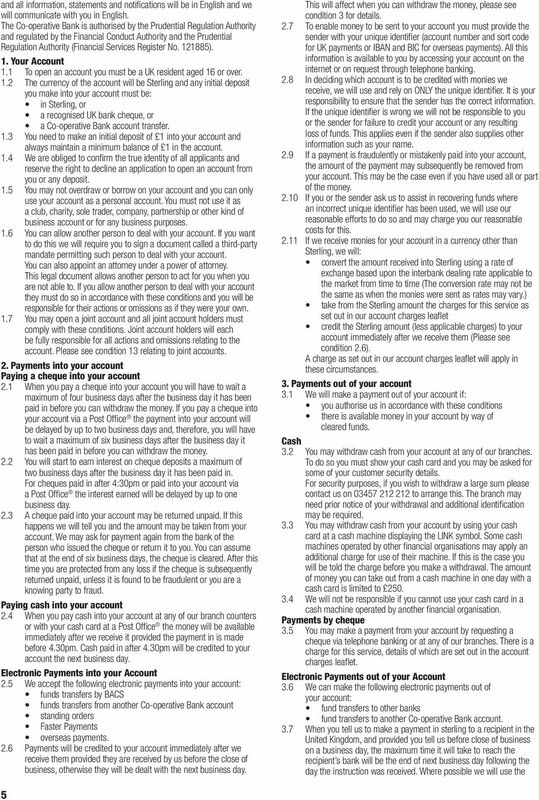 For all other changes to charges for the reasons listed above: where the change is more favourable to you we will tell you about the change on our website, by branch notice, statement message or statement insert. where the change we make is not favourable to you we will tell you about the changes by personal notice at least 30 days before we make the change. The change will apply to your account automatically. However, if you do not agree to such a change you can, at any time up to 30 days from the date we tell you of the change, switch or close your account without paying any extra charges or interest. If you do not switch or close your account you will be deemed to have accepted the change. 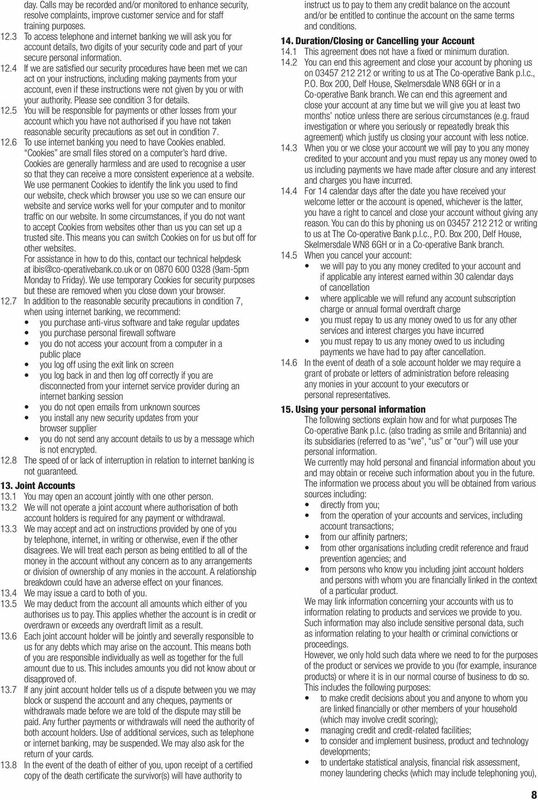 Remember you can close your account at any time if you want (see condition 14). Changes to interest rates 16.3 We may change interest rates provided there is a valid reason for doing so. Changes may be made to interest rates for the following reasons: to respond to a change or changes in the bank rate (that is the rate set by the Bank of England (or any successor)) to respond to a change in LIBOR (that is the London Inter Bank Offered Rate) or equivalent money market rate which impacts on the costs we incur in acquiring funding to respond to changes in the rates of interest which banks or other organisations offering similar services charge to customers with similar products to respond to changes in our credit assessment of you. Where your account is interest bearing, we may make changes to our credit interest rates for the reasons listed above as follows: where the change to credit interest rates is more favourable to you we will inform you of any change at the earliest opportunity after the rate is changed in national press advertisements, statement messages or statement inserts, or by writing to you (this can include ). The new rates will apply to your account automatically from the date the rate changes where the change to credit interest rates is not favourable to you we will inform you of any change by personal notice at least two months before we make the change. The new rates will apply to your account automatically. However, if you do not agree to such change you can, at any time up to two months from the date we tell you of the change switch your account or close it immediately without paying any extra charges or interest. If you do not switch or close your account you will be deemed to have accepted the change. 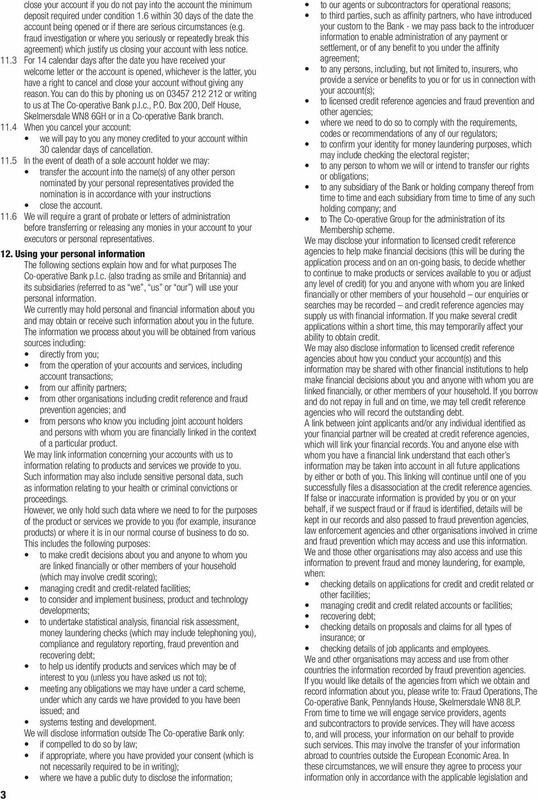 Remember you can close your account at any time if you want (see condition 14) Where we make a change for one or more of the reasons in conditions 16.1, 16.2 or 16.3, we will do so in a reasonable and proportionate manner If we make a number of changes or a major change to these conditions during any 12-month period, we will provide you with a summary of the changes and let you know where you can obtain an updated copy. 17. General 17.1 It is our aim to ensure a complete service at all times, but we will not be responsible when failure is caused by abnormal and unforeseeable circumstances beyond our (or our agents and/or subcontractors ) control the consequences of which would have been unavoidable despite our efforts to the contrary The Co-operative Bank plc is covered by the Financial Services Compensation Scheme (FSCS), which would pay compensation of up to 85,000 to eligible depositors in the event of the bank becoming insolvent. smile and Britannia are trading names of The Co-operative Bank and, as such, protection provided to depositors by the FSCS is limited to 85,000 for the total amount of combined deposits held with The Co-operative Bank, smile and Britannia. Certain customers are not covered by the FSCS. The exclusions include large businesses or organisations, large companies and local authorities: visit for further details We may transfer our rights and/or responsibilities under this agreement to any person if: that other person is authorised to accept deposits and writes to you and undertakes to carry out all our duties and obligations under this agreement. If it does so, you agree that we will be released from all those duties and obligations we reasonably believe such person is capable of performing our responsibilities. You may not transfer any of your rights or responsibilities under this agreement to any person You may be responsible for other taxes or costs that are not paid by or via us, e.g. higher rate tax This agreement with you is governed by the laws of England and Wales. Any dispute which arises in relation to this agreement shall be dealt with by any court in the UK, Isle of Man and Channel Islands which is able to hear the case If you have a complaint please telephone us on or write to The Co-operative Bank, Customer Feedback, 4th Floor, Miller Street, Manchester M60 0AL. If you still remain unsatisfied you may be entitled to refer your complaint to the Financial Ombudsman Service, Exchange Tower, Docklands, London E14 9SR or telephone The Co-operative Bank is authorised by the Prudential Regulation Authority and regulated by the Financial Conduct Authority and the Prudential Regulation Authority (No ) and holds an Interim Permission in respect of consumer credit activities and subscribes to the Lending Code and the Financial Ombudsman Service. Triodos Bank. 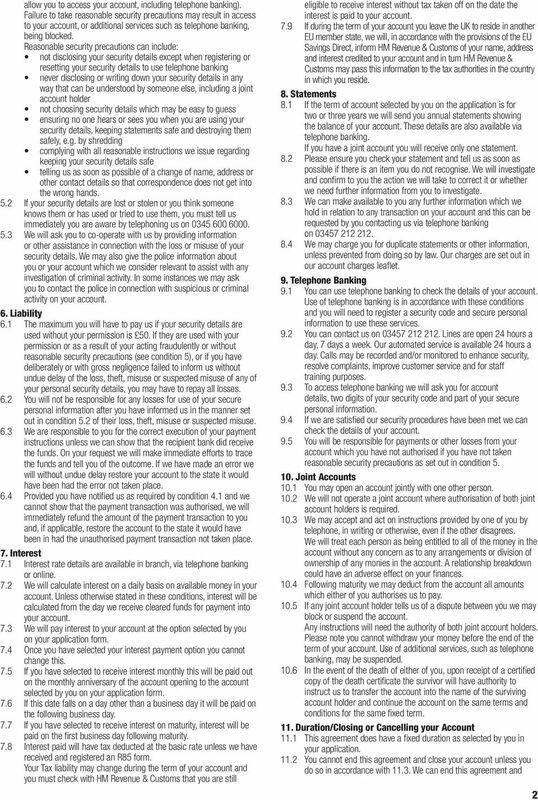 These are the Terms and Conditions for our personal banking accounts.